I started the year competing in the Australian Laser Association Open Nationals in Queensland where I was pleased to take out the Open Radial Laser title from a field of 90 boats from 8 countries. 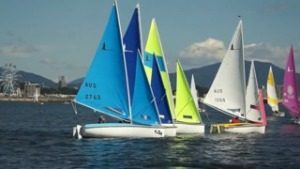 I followed this up by competing in the Australian Sailing Youth Nationals, gaining the Laser Radial boy’s place in the Australian Youth Sailing Team. After a few weeks rest at home after the Nationals I started to get back into training, but had an off water injury which saw me out of the boat until late March. When I was allowed to come back it was at a slow return with reduced time on the water and minimum load in the gym. With my health a lot better I travelled to Karatsu in Japan for the Junior Olympic Cup at the end of April, which is the Japanese qualification event for the Youth Worlds. I was pleased to be able to win this, from a field of 40 boats, after having such a short period back in the boat. 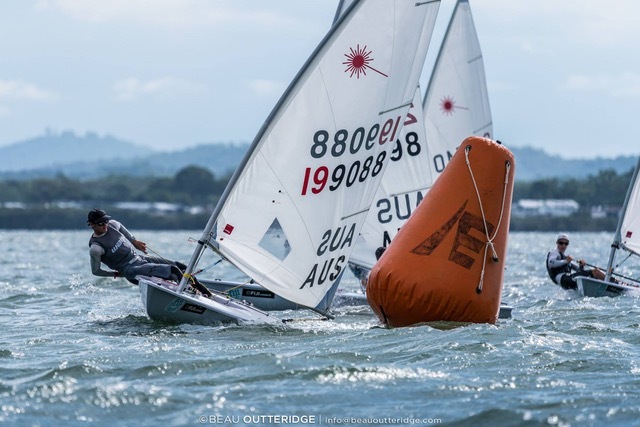 Whilst juggling my mid-semester exams, I travelled twice to Sydney for training camps with the Youth Team and the Australian Sailing Women’s Laser Radial squad. It was then decided that travelling to Kiel, Germany for the Laser Radial Open Men’s Worlds as part of Kiel week would be a good preparation for my Youth Worlds in July. Travelling to Kiel on my own added another component to the usual regatta pressure, but going into the event I focussed on the fact that I was there to learn, as I didn’t have much expectation of doing well because of my injury earlier in the year. I started to lead the overall results at Day two and managed to hold onto my lead and win by 15 points. My overall results were 4, 1, 2, 1, 1, 1, 1, 6, 3, 4. We were allowed one drop, resulting in a nett of 18 points for me in a field of 92 boats. 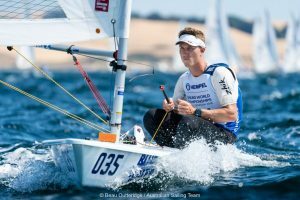 I’m the youngest person to win an ILCA Laser Radial Open Men’s Worlds and one of the youngest Australians to win an Open Sailing Championship. I came straight home to have five days at school and to re-focus before I flew out to Sydney for a training camp and on to America for the Youth Worlds. I travelled to Texas with a group of 12 sailors, including the other WA representative, Rome Featherstone in the 420 class. The Youth Worlds in Corpus Christi, Texas, sailing against 58 sailors from 58 countries, was a great experience as it’s an event you can’t really describe in the way of pressure and environment as all the teams are accommodated in the one building. I felt that this event was the strongest I’ve competed in as I fought hard for every point and maintained really strict routines on and off the water. However, due to some small mistakes on Day three, I dropped out of the lead and slipped into third overall, missing out on second by one point on the final day. All my racing this year has been quite significant in my growth as an athlete as I’ve experienced racing at the high end of each event I’ve sailed in. I’ve been fortunate to win my first world title and have gained more motivation to win another world title in the near future. I want to thank everyone who has made it possible for me to travel to these events. I realise that I couldn’t be where I am without my family and organisations like The Ron Tough Yachting Foundation who provide me with these opportunities. I also want to acknowledge the great coaching that I receive in WA, especially the contribution of WAIS, which allows me to sail at a high standard and test my ability against the best sailors in the world in my class. I know that WA is the best State in Australia and the World for sailing, especially with all the support I receive. Thank you, Ron Tough Yachting Foundation for the financial support that you have provided to me in the past, particularly last year when I was the recipient of the Foundation Scholarship, and again this year with a further grant. It really makes a difference.